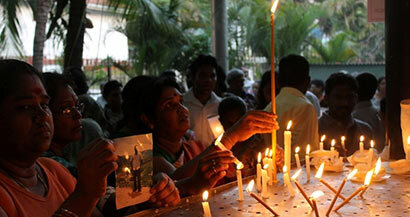 The Presidential Commission to Probe Disappearances will commence its first sitting in Jaffna today. The Commission will be recording verbal submissions from 14 to 17 February. Complaints will be recorded from 13 Divisional Secretariat Divisions including Valikamam-East (Koppay), Thenmarachchi, Chavakacheri and Jaffna from 9:30 a.m. to 5:30 p.m. The Commission said people from Koppay, Irupaalai, Kalviyankaadu, Urumpirai and 10 other Grama Niladhari divisions can submit their oral submissions today. Tomorrow’s sittings will be held in Chavakacheri, Maravampulo, Sanganai , Kalvayal, Nunavil, Mattuvil , Chandrapuram and 10 other divisions. On 16 February, complaints will be recorded in Jaffna and Navanthurai Grama Niladhari divisions and on 17 Kolumbuthurai, Chundikulam and four other Grama Niladhari divisions. The first sitting of the Commission took place in Kilinochchi last month. This is an excellent initiative of the Mahinda Rajapaksa Government in line with the recommendations of the LLRC. What we have failed to do is to draw the attention of the meddlesome “International Community” towards this initiative. We should have invited M/s Navi Pillay-Silva and M/s Nisha Biswal Desai to participate in the sittings and deliberations of this Commission. This is grass-roots listening to the woes of “affected” communities and such initiatives are not common in other parts of the world. The proceedings of this Commission should be videod and provided to all UNHRC members. hey whats happening ? they did those and having the investigations their own? moving cards like TN politicians?